Angela Yvonee Davis, is an American author, activist and educator, was born on January 26th, 1944 in Birmingham, Alabama. She studied at Sorbonne where she became a master scholar. She later joined the U.S. Communist Party, jailed for charges related to a prison outbreak, though she was ultimately cleared. Angela Davis has worked in several capacities; including, as a professor of philosophy and activist, advocating for prison reforms, alliances across color lines and, most importantly, gender equality. As an author, she wrote the famous book Women, Race & Class have been read across the globe. 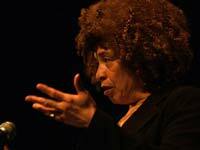 Angela Davis is the daughter of Frank B. Davis who was a business man and a teacher and Sally E Davis who was a teacher. She attended Carrie A. Tuggle Elementary School in Birmingham, Alabama and graduated to Parker Annex Junior High School. The next stop of her formal education after junior high school was Birmingham High School. Her knowledge on radical prejudice is rooted on her experiences with discrimination, given that she grew up in a rather hostile environment. In fact, her parents, Frank and Sally, made sure that she became aware of the class oppressions and radical injustices against the minorities at an early age. They educated her about the struggle that the blacks faced in the segregated south. They even became members of NAACP and friends of members of the Communist Party. Angela emerged as a national prominent activist in the 1960’s when she was the leader of the Communist Party in the United States. During that time, she had close ties with the Black Panther Party through her participation in the Civil Rights Movement. In August 1970, Angela became engrossed in a prison case involving three brothers in the Soledad prison. Jonathan Jackson, one of the Soledad Prison Brothers attempted an escape. He entered the Marin County Hall of Justice Courtroom with a weapon that was registered to Angela. The events that took place in the courtroom left several people, including the judge, dead. The authorities did a biased investigation which revealed Angela’s involvement in the escape attempt even though she was nowhere near the courtroom on that day. This is how she was catapulted into the national limelight after she appeared on FBI’s list of ten most wanted criminals in the U.S.
Angela was arrested and tried and acquitted of all the charges and during that period she wrote a number of essays which were published in 1971 in a collection entitled, If They Come in The Morning: Voices of Resistance. There were several songs about Angela which were recorded and released during that period not to mention albums that were dedicated to her. After her release, Angela Davis visited Cuba in the footsteps of her fellow activists Huey Newton, Robert F. Williams and Assata Shakur. Her visit had an overwhelming and unplanned effect on the Cuban society. It is reported that prior to her visit Cuba’s government had banned afros. However, after her visit, afros became so popular especially amongst the Afro-Cubans that the government had no control over the subject. During her stay in Cuba, she witnessed a racism-free country and this led her to believe that the fight against racism could only be won under socialism. Angela has achieved so much in her life, done so much to an extent that she caught the attention of people like Ronald Reagan. She is one of the founders of Critical Resistance and has been hailed for her contribution in movements to abolish Prison-Industrial Complex. Presently, Angela Davis is the presidential Chairperson for African-American & Feminist Studies Departments at the University of California.